Fashionistas Walk The Runway at Beauty of S.T.E.M. For young fashionistas ages 10 to 17, these girls have style. From tutus to pants and accessories, they know their fashion! To create their unique designs, participants worked with organizations such as The Pittsburgh Center for Creative Reuse and Knick Knacks and Paddy Wacks. The clothing, which was designed and handmade by the participants, included tutus, pants, and vests made in a variety of neon shades of green, pink, blue, and purple combined with black or white shits that made the outfits pop. When I arrived at the Carnegie Library in Homewood for the Fashion Show, I didn’t know what to expect. I had never been to a real fashion show, and I had only seen them on TV. I expected young women in fancy dresses posing and walking on the runway while a panel of judges gave them a score, like a competition. I made an assumption based on my limited experience, but what I saw opened my eyes. The event started with a vocal performance by Nayla Strothers. Then, the Tie-Dye Divas walked the runway, followed by a hip hop dance number, compliments of the Glam Girlz. Then came the “Tulle + Ties = Tutus”, and last, but certainly not least, Ombre on Fleek. Shimira Williams, the event coordinator, provided details about each group in-between their presentations. Of interest was Williams’ description of the participant’s passion for fashion. Williams is dedicated to working with students who have a genuine interest in the world of fashion and design. She emphasized the participants were encouraged to take their time to complete their outfits. When you see models on television, it appears that you have to be “beautiful” by being slim. When I saw these girls model their designs, I thought it was a step up in fashion. All the girls were different sizes and shapes, but their passion for their designs was breath-taking. I adore the unique way they set up the show, and I hope these young women become successful in fashion. Dejah Burke is a sophomore at Propel Braddock Hills High School who lives in Penn Hills. 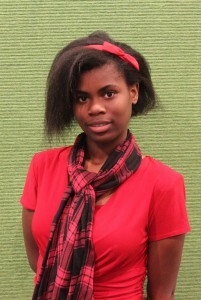 She has participated in creative writing contests and loves photography.